Use the chart below as a reference for making connections between the Arduino, TB6612FNG motor driver, motors and battery packs. I remember that the wires from my 3V battery pack were too thin to connect to the breadboard. I resolved this by tinning the end of the wire with a bit of solder. You can either do this, solder pins to the wires, or replace the flimsy wire with proper hookup wire. 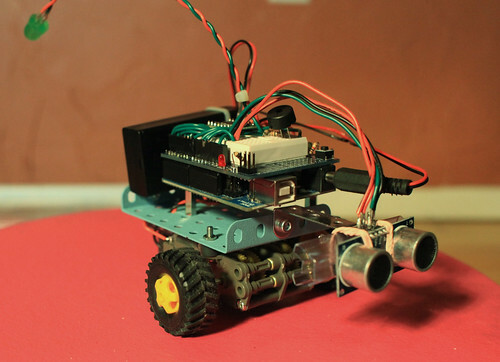 Now we can test the basic functionality of Clusterbot, we just need to write a little code first. I've decided to make a function for each basic type of movement to keep main as clean as possible. I'll provide this logic table, derived from the TB6612FNG datasheet, as reference. It defines how we make the motors spin in the direction and speed that we want. Clusterbot has quite a few jumper wires, and I've found I can hardly pick him up without accidentally pulling one of the jumpers out. It's a real mess, it's time to clean things up a bit. I substitute sloppy jumper wires for hookup wire cut to the proper length and pressed flat. 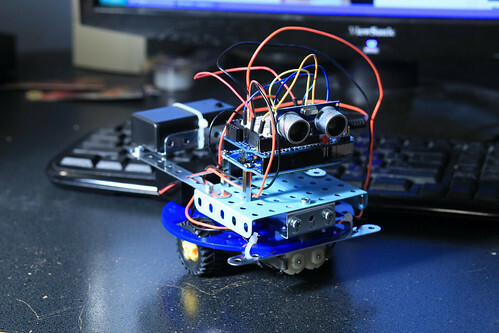 We'll add a sensor and a few other gadgets, and let Clusterbot start making a few decisions for himself. Electronics hobbyist after discovering the Arduino two years ago. Worked as a Wideband and Satcom technician in the USAF. Enjoy sharing my projects with others via blogging and on my YouTube channel. Currently working for Apple.